Congratulations to Patrick Hurney on his nomination for Adult Footballer of the Year and to Conor Prunty on being nominated for Underage Footballer of the Year. This is just recognition for the fantastic year both have had in the green and white of Ballinacourty. 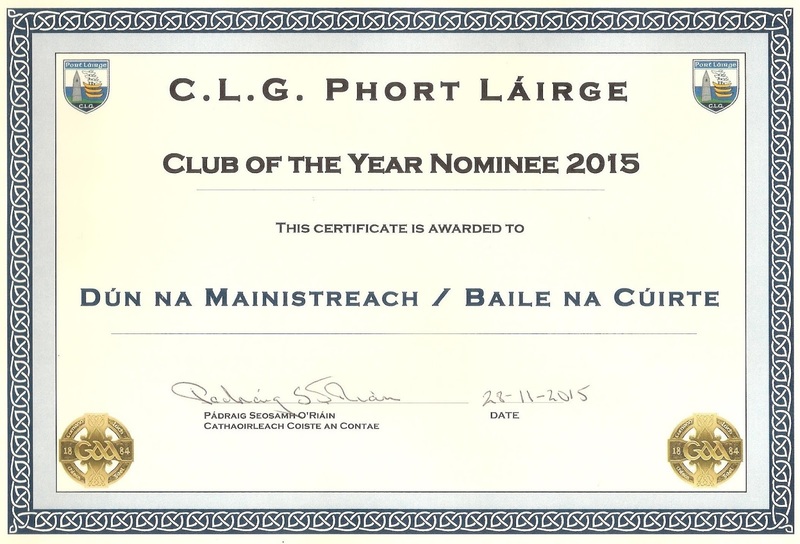 Our club has also been nominated for Club of the Year. 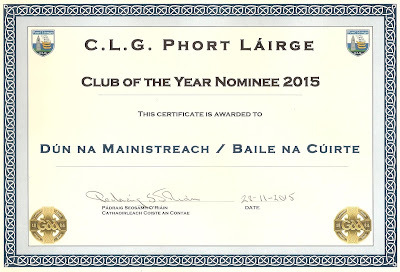 The awards ceremony will take place in Lawlor's Hotel on Saturday, 28th November. Our ever popular Jack the Joker fundraiser continues this Sunday night in Minnies Bar where the jackpot is €6,800 as on Sunday night last Jason O’Donovan was drawn out of the drum and chose card number 42 which wasn’t the Joker although he did win €50. Paul Breen and Stephen Enright won €25 each. As well as our group of ticket sellers tickets can be purchased from Convenience Store Ballinroad, Village Flowers, Spar, Mousies Takeaway, Minnies Bar and Crotty’s Corner Bar. On Friday night last we took on Stradbally in the County Final in Fraher Field where unfortunately we suffered a two point defeat. Whilst naturally all involved with the team were heartbroken at the full time whistle the players and management team can be assured that all in the club are very proud not alone of the performance given by the team on the night but of their performances throughout the year. The majority of the team line out in both codes for the club and continue to give wonderful commitment to the club, which we are most grateful for. Hopefully we will see them all back in action in 2016 challenging for honours yet again. SUBS: M. FIVES, C. McCARTHY, M.MAHER. Our Junior Footballers lifted the spirits of the Club on Saturday afternoon last when they defeated a gallant Bonmahon side to claim the County Title in Stradbally. Both teams are to be commended for serving up such a good game of football in such difficult underfoot conditions, a great credit must go to our players for the fine displays of football they gave all year. This was our first year back in this Championship after taking a break from it for a number of years and the management team of Pat O’Brien and Pat Keane did fantastic work all year keeping the team going. 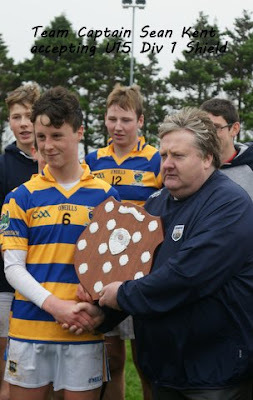 After the game Conor O’Dwyer as team captain accepted the cup from Sean Michael O’Regan. TEAM: D. ENRIGHT, R. CONWAY, C. O’DWYER, P. COLLINS, S. O’GORMAN, D. MORRISSEY, T. COLLINS, J. BERESFORD. 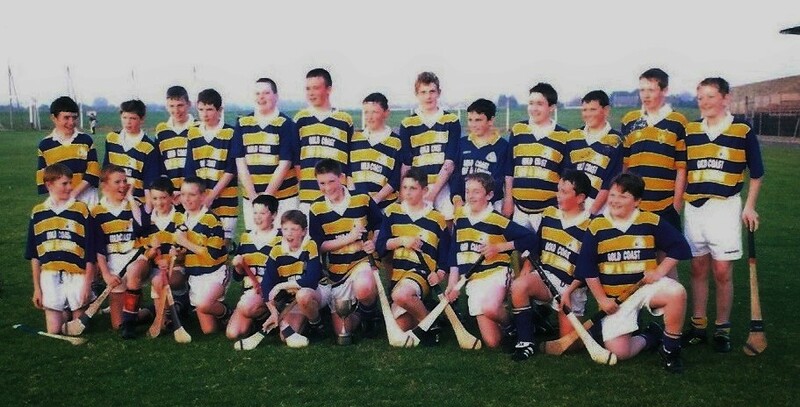 I. KIELY, S. KEARNEY, D. SWEENEY, D. HICKEY, B. MULLIGAN, M. COLEMAN, R. PROCTOR. SUBS: N. BURKE, T. HANRAHAN, C. BRENNAN, P. BERGIN, C. O’CONNELL. This Sunday we are holding a Monster Bingo in the Park Hotel at 3pm with over €3000 in prize money. We would appeal to as many club members and supporters as possible to come along on the day and show your support. On Saturday, 18th October the U13 Camogie girls made history by becoming the first Camogie team in Abbeyside to win a county title. The Abbeyside Camogie Club was founded 5 years ago and Saturday’s victory was the result of the time and effort put in by the girls. The girls started well with an early goal which helped to calm the nerves; throughout the game the girls worked extremely hard displaying a high skill level. There were scenes of jubilation at the final whistle when the scoreboard showed that Abbeyside had won their first county title in Camogie. The girls then went to the Park Hotel to celebrate the victory. Thanks to the county board for giving the girls the opportunity to play in the Fraher Field. The club would like to thank the girls for the efforts they put in to training over the last 5 years and to all of the parents who helped out throughout the year. 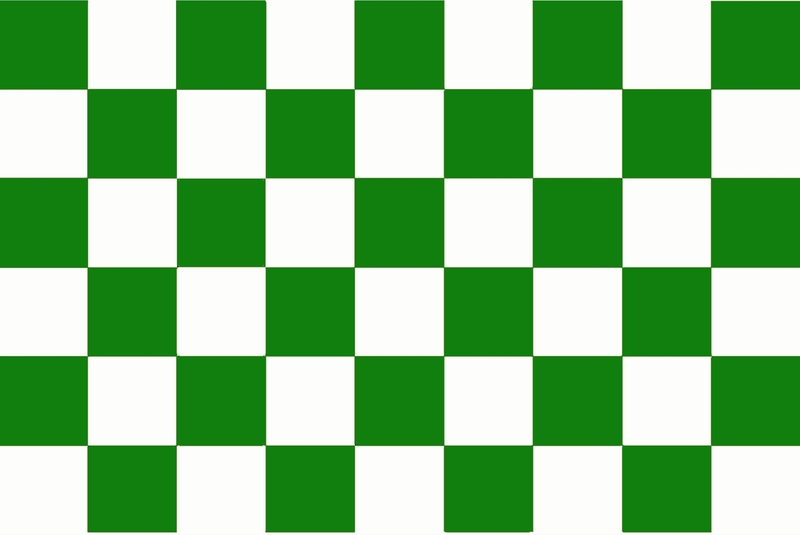 We would also like to congratulate the Abbeyside U13 Footballers on their recent victory over St. Pat’s in the county final.